At a press conference in the Austrian capital, Minister Rodriguez said that Cuba is ready to continue talks on pending bilateral issues with the US government, but will never negotiate any matter inherent to the sovereignty and independence of the Cuban people. He confirmed Cuba's decision following President Donald Trump's speech last Friday from Miami, in which he announced the determination to intensify the economic, commercial and financial blockade imposed by Washington against Havana by reversing some measures adopted by his predecessor, Barack Obama. 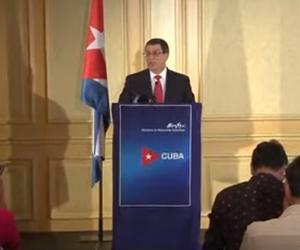 During the press conference, the Foreign Minister recalled that among the provisions contained in the new policy directive on Cuba, signed by Trump, is the prohibition of economic relations between companies in his country and national companies linked to the Revolutionary Armed Forces and the Ministry of the Interior. He pointed out that, in addition to ignoring the majority opinion of the Cuban people, who wants to have a better relationship with the US, these guidelines will cause economic damages "not only to state companies, but also to cooperatives, and will especially hurt private sector workers " of the island. He added that the freedoms of American citizens for travel are also restricted, and opportunities for US companies and entrepreneurs are reduced in the face of competition, coupled with the loss of income and employment that this would generate. Rodríguez Parrilla acknowledged that Trump's policy "marks a setback in bilateral relations," and has been roundly rejected by large majorities and voices inside and outside the US. He anticipated that such "unpopular and unsustainable" measures will also affect US relations with the nations of Latin America and the Caribbean, and will undermine the credibility of US foreign policy. The Cuban Foreign Minister assured that Trump ignored the majority support to the lifting of the blockade and the normalization of relations with Cuba, by members of Congress, many of them Republicans, as well as the business sector, various civil society organizations, Cuban.Americans, the press, social networks and public opinion in general. Referring to Washington's sanctions on Havana, which date back more than half a century, Rodríguez Parrilla said that history would force a US government to lift them, and added that the Island will wait for that moment to arrive with "all the patience, resistance and decision". In another moment of the press conference, the Minister of Foreign Affairs referred to the "grotesque show out of the Cold War" offered by Trump "before a small audience composed of old minions and thieves of the Batista dictatorship, mercenaries of Playa Giron , terrorists, politicians and cheaters ". Trump, once again badly advised, makes decisions that only favor petty interests of an aging and extremist minority of Cuban origin, said the Cuban Foreign Minister. The Cuban government issued an official statement Friday rejecting the new directive signed by the US president, called the Presidential Memorandum of National Security on Strengthening US Policy towards Cuba. Trump confirmed that he thus repeals the Policy Directive for the normalization of relations with Cuba, issued by Obama in October 2016, and reinforces the application of the extraterritorial blockade, among other limitations.